There are over 1 billion users of virtual worlds, online communities where users have avatars and participate in various simulated environments. Even more impressive than that number: roughly half of those virtual world users are under age 15. Allowing children under age 13 to participate in online communities often raises questions about security and safety, and many parents fear predators and cyberbullies. Kid-oriented websites have a number of measures to prevent these dangers for their members, including logging chats and flagging questionable content and suspicious accounts. "Virtual worlds give children an opportunity to participate in a large social environment, with people from all over the world, often unsupervised by their parents." But there may be other problems with these sites too, including the intense commercialization of many of them. Often virtual worlds (for children as for adults) encourage not just game-play but consumption, and kids need to buy virtual goods (sometimes with real money) in order to dress their avatars and decorate their virtual homes. Purchasing in-game items often gives users more status, and that's a lesson in itself that parents may or may not wish to have imparted to their kids. Virtual worlds are often dismissed as merely games and most do not claim to be educational websites. But there are plenty of informal learning opportunities for kids in these environments, particularly as these are often their first experiences with online communities. Participating in a virtual world can help kids learn how to communicate and behave online. They can also be utilized to help bridge online and offline ethics. One virtual world, MiniMonos, for example, has an environmental theme and tries to make sustainability lessons clear to its users. If you don't keep up with the recycling around your avatar's treehouse, there are in-world consequences. The virtual world also ties this to the real world as well, rewarding users for various environmental actions they take in their own communities. Here's a list of five virtual world sites that can unlock all kinds of adventures, curated by a teacher who's tested many of these sites in his classes. It's this connection to community -- again, on- and offline -- that may be most one of the greatest benefits of virtual worlds. Despite fears about predators, virtual worlds do offer kids a place to experiment and expand socially. 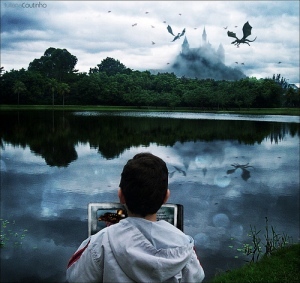 Virtual worlds give children an opportunity to participate in a large social environment, with people from all over the world, often unsupervised by their parents. That may sound scary to parents, but for kids, it can be very liberating. As always, parents should make sure they know where and what their kids are doing online. The best virtual worlds offer reporting features for parents and keep in contact with them should any problems arise. They also allow parents to enter alongside their children. Although virtual worlds may be a relatively new phenomenon, the fact that kids under 13 are embracing them suggests that we're only beginning to see the potential of these online communities.